Is it because I’m disgusted at union corruption and waste? Is it perhaps because I harbour a distaste for collective action? Is it a lot simpler than that? Is it simply that being a union member seems awfully expensive? I was a union member once, but not any more. My last job I made between $70,000 and $80,000. The union fees at the Media Arts and Entertainment Alliance are $12.65 a week, just under 1 per cent of wages, at $658 a year. If I had to make a list of things I spend more than $658 a year on, it’s a) short and b) full of things that are extremely important to me. A former colleague at the Fin Review once tried to convince me to join. (Yes, there are union members at the Fin …at least in the Melbourne bureau…). He compared union membership to a gym membership He was trying to make it sound reasonable, but gym membership is exactly the sort of expense I try to avoid. Value is subjective, and it could be I just don’t understand the merits of membership. But if so the union hasn’t done enough to communicate it to me. And I’m clearly not alone. Footy clubs have much the same incentives as unions to maximise their memberships, and they are creative about it. You can get all sorts of packages that meet your needs. Geelong offers a membership for $50 and one for $407, with a swathe of options in between. 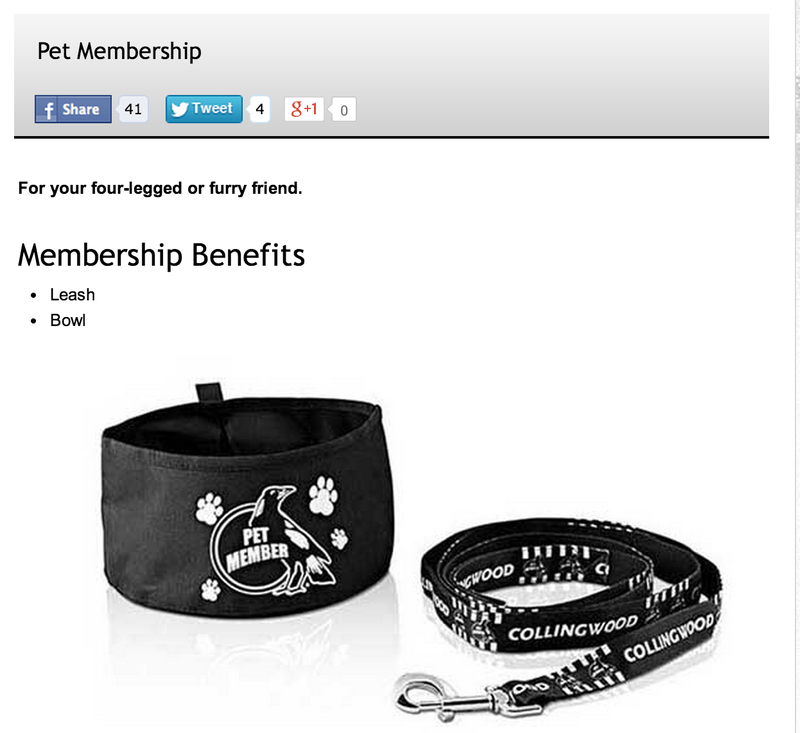 Collingwood is even more creative, with pet memberships. I’m not aware of unions doing the same, even as membership in Australia has collapsed. I am not ideologically opposed to unions. I was a member of the National Union of Workers while I was a student doing telephone market research at DBM consultants. We had great pay and conditions and I know for sure that was not a coincidence. I might even join a union in the future. But the value proposition has to be there for me. That means I need to feel good about the price, what I get for my money, and about the union in question. At the moment news about the amazing places nurses unions fees ended up after they were paid to the Health Services Union makes me wonder if unions are being run as cleanly as they should be. That makes me even more reluctant to part with my hard-earned. A fair start for unions might be to choose to submit themselves to the full responsibilities of companies. The recent ACTU study into union governance looks, to me, about as fierce as a wet lettuce. Unions are going to face a lot more bad PR under the current government. It might be smart for the movement to outflank the criticism, and commit to the highest standard of oversight and probity, before Tony Abbott runs them through with the rusty blade of his Royal Commission into union corruption. If they can prove they are protecting the union dues of existing members at the same time they think about offering value to potential members, they might even win a few new ones. Next Next post: Rapid growth of WhatsApp should actually make Facebook frightened.